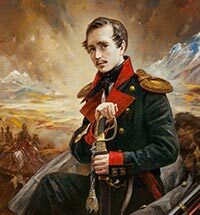 THE YEAR 2014 MARKED THE 200TH ANNIVERSARY OF MIKHAIL LERMONTOV'S BIRTH. ONE OF THE SERIES OF EVENTS ORGANIZED BY THE STATE A.S. PUSHKIN MUSEUM TO COMMEMORATE THIS IMPORTANT ANNIVERSARY IS THE ALL-RUSSIAN EXHIBITION PROJECT, "MY HOME IS ALWAYS THERE, IN THE HEAVEN'S VAULT..." THIS PROJECT RECEIVED FINANCIAL AND ORGANIZATIONAL SUPPORT FROM THE RUSSIAN MINISTRY OF CULTURE AND THE MOSCOW CITY DEPARTMENT OF CULTURE, AND INCLUDED 37 PARTICIPANTS, AMONG THEM MAJOR RUSSIAN MUSEUMS AND ARCHIVES, LIBRARIES, THEATRES, AND PRIVATE COLLECTORS. IT WAS THE FIRST EVENT OF SUCH MAGNITUDE IN RUSSIA IN 70 YEARS: IN 1941, WHEN THE COUNTRY WAS PREPARING A FITTING COMMEMORATION OF THE CENTENARY OF THE POET'S DEATH, ALL PLANS HAD TO BE SET ASIDE. EVEN THOUGH A MAJOR ANNIVERSARY EXHIBITION OPENED ON JULY 26, ON THE FOLLOWING DAY ITS ORGANIZERS HAD TO START PACKING ITS EXHIBITS TO BE SENT AWAY TO SAFETY. The exhibition “From the Western Seas to the Very Gates of the East. Russia at the Time of Pushkin” – a look at the Russian Empire as it was seen by Alexander Pushkin and his contemporaries – has been one of the most memorable events of 2010 at the Pushkin Museum in Moscow.